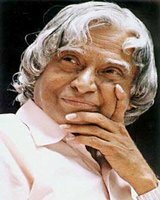 Abdul Kalam 15 October 1931 27 July 2015 Indian Jainulabudeen Ashiamma Scientist Became 11th President of India. Contribution to the ballistic missile and earned him household name "Missile Man of India". A list of popular Hindi Abdul Kalam quotes are given below.